Good for drinking on its own or for use in baking, buttermilk has a tart flavor and comes packed with essential nutrients. When you're shopping for buttermilk, follow U.S. Department of Agriculture guidelines and opt for reduced-fat or fat-free buttermilk instead of the full-fat version. You'll get all the nutritional value of full-fat buttermilk -- including essential minerals and vitamins -- but you'll skip some of the added calories and fat. If you prefer buttermilk's rich taste to regular milk, you can easily make the swap without expanding your waistline -- there's only a 4-calorie difference between a cup of low-fat buttermilk and low-fat milk. One of the major health advantages associated with buttermilk is its calcium content. You need 1,000 milligrams of calcium daily, and each cup of low-fat buttermilk brings you 284 milligrams, or 28 percent, closer to this goal. That's just slightly less than regular low-fat 1 percent milk, which contains 305 milligrams per cup. Getting enough calcium in your diet helps slow bone loss as you age, helps support new bone growth and staves off osteoporosis. Buttermilk's calcium content offers other benefits as well, including support for cell communication and muscle contraction. Add buttermilk to your diet and you'll also get more riboflavin, or vitamin B-2. Your body uses riboflavin to activate enzymes in your cells, which helps drive energy production. Riboflavin also supports liver function -- which helps detoxify your body -- and helps you make uric acid, a strong antioxidant. Each cup of buttermilk boasts 377 micrograms of riboflavin. This corresponds to 29 percent of the daily riboflavin needs for men and 34 percent for women. It falls a little short of the riboflavin content of low-fat milk, which provides 451 micrograms. Buttermilk also boosts your protein intake. Every cell in your body contains protein, and all of your tissues rely on protein to repair and maintain themselves. Protein is especially important for strong bones, muscles and skin. 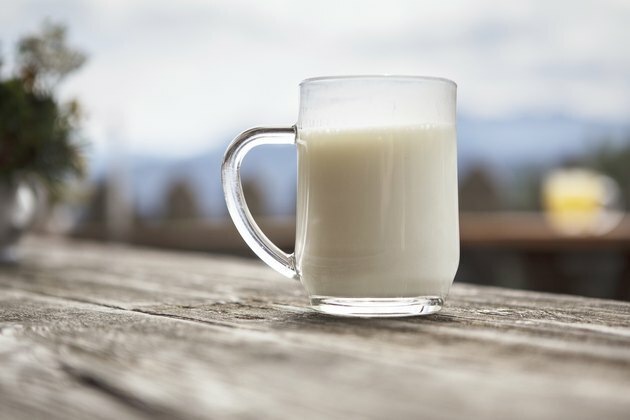 A single cup of buttermilk supplies 8.1 grams of protein -- roughly the same amount as regular low-fat milk -- which makes up 15 and 17 percent of the protein needs for men and women, respectively, according to dietary intake guidelines published by the U.S. Department of Agriculture. Watch out for two potential pitfalls -- fat and sodium -- when adding buttermilk to your diet. Even low-fat buttermilk contains 2.2 grams of total fat per serving, with 60 percent of that made up of harmful saturated fat. In addition, buttermilk contains a surprising amount of sodium -- 466 milligrams, or 20 percent of your daily limit. That's much higher than the sodium count for regular low-fat milk, which contains just 107 milligrams per cup. Both saturated fat and sodium can threaten your cardiovascular health -- sodium boosts blood pressure, which increases the strain on your blood vessels and heart, while saturated fat increases your cholesterol. Consume buttermilk in moderation, as part of a balanced healthy diet, to minimize your risk.